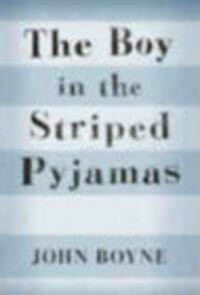 The boy in the striped pyjamas is a book based on the Holocaust that took the lives of many Jewish prisoners of war. Depicting a boy named Bruno and his family that was forced to leave their house in Berlin to be relocated to Auschwitz . Due to father's job as a commandant for the German Nazis . This was only after the Fury had came to their house for dinner . Mother was first very hesitant to relocate but they all had no choice as Father would otherwise be left alone in Auschwitz . The family moved and settled in Auschwitz, the first few months Bruno was being extremely bored and was really hating the new house as it was not as big as their old house back in Berlin and the house was literally located in the middle of nowhere . Nothing about Auschwitz was really making him like it there and he was constantly against the idea of staying here. No kids , Nothing to explore and they had no neighbors too. His room had a window , looking at through it he saw the wooden posts that were adjacent to each other and were heavily barbed wired . On the other side of it he could see people that were all wearing the same striped pyjamas as they were all lined up in a straight and neat rows with some soldiers who seemed to be shouting at them. Bruno did not understand anything being a typical 9 year old boy , he was curious about them but mother and father had told him that he was not allowed to go towards the area where the fences were located. Bruno was ignorant towards the rules that were set to him and one fine day he decided to go exploring as how he enjoyed exploring whilst he was at Berlin. He ventured through the plain fields past the tress. He was soon getting bored and hopeless as he seemed to have not found anything that was going to make this exploration a worthy one. He looked in the distance , a blob that soon became a figure as he approached it slowly and cautiously trying to imitate what a professional explorer would do. Slowly as it became more clearer and clearer the figure soon transitioned into a small boy that was just sitting down on what seemed like pure dirt on the other side of the fence that mother and father had continuously warned him not to ever come near. Bruno's face enlightened with joy as he had finally found a kid that he could make friends here with in Auschwitz. They stared at each other for a moment before finally starting a conversation. They both had identical birth dates and Bruno was delighted finding a new friend something he had been trying to find all these while , Shummel , was the name of the boy. Shummel was on the other side of the fence though, but that did not stop them from constantly seeing each other for almost all of Bruno's time staying in Auschwitz. Their friendship prospered and they were soon best friends. As the days past and Bruno was constantly meeting his new best friend , Bruno noticed that Shummel was getting thinner and thinner as the days went by and his outfit the striped pyjamas was not even once changed into a fresh pair and it was getting dirtier by day. Bruno as a friend had made his own initiative to always bring food with him whenever they met . Until one day when father called Bruno into his office to tell him that he was going to send them back to Berlin. Bruno by then had been already used to living in Auschwitz and seeing his secret friend , Shummel , everyday . Bruno was sadden by the news he had received and he was hesitant to tell Shummel . When he met Shummel the following day, he was in a dilemma to tell Shummel about the sad news but all in all he still said it regardless. Shummel was in shock and tears formed in his eyes as he was never going to be seeing Bruno forever. They continued on with their conversation and they Bruno made a promise to Shummel that he will go on the other side of the fence just so they can meet face to face without the fence being a barrier and to also help Shummel to find his lost father with Shummel helping him with his disguise. The day they were both waiting for came, but it was raining cats and dogs on that day. But that has not stopped Bruno from proceeding with his plans. They met each other on that day that was hoped to be the final time they met. Neither knew what was coming. The plan when smooth and the moment they met, they stared at each other for the first time without ever having the barbed wires in between them. They stared at each other with each having a strong urge to embrace . They never did . Shummel led the way as he showed Bruno what it was like leaving inside here. The conditions were extremely filthy and the adults all looked the same as Shummel , small framed,skeletal and their faces were all covered in dirt. Bruno began to hesitate about being in here but he was not going to be unkind to Shummel as this would be the last time they met. The soldiers in there were all just holding their weapons patrolling laughing and seemed to be having a fun time whilst the people in the striped pyjamas were all saddend. Suddenly ... The soldiers began blowing their whistles loudly and all the people in the striped pyjamas were all being forced to start a march. They all obliged with some even being seemed forced out of their will to march. Bruno was starting to panic and was starting to think this was a bad idea but he did not want to just leave his best friend as it is so he stayed put with Shummel . They all marched and were all brought into a hut where they were finally out of the rain. Hoping it was just nothing Bruno did not seemed to even got bothered as everyone was packed like sardines in the Hut.The lights in there were dark and suddenly the door was closed . Bruno did not know anything but he held hands with Shummel as they were packed in the room with the other people . That was the final time Bruno was ever seen again. Mother , Gretel and Father were all extremely saddened with this great loss . This was an extremely interesting book, to read and the moment I flipped it from the first page till the last I could not really apprehend on the ending that was extremely uncalled for . In all this book was extremely interesting and the arrangement of the chapters were all planned out really well . The story line was phenomenal and this was the book has really changed my initial view of what a fiction book would be like .